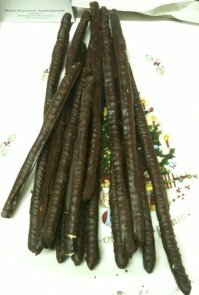 Now, when I went to Carluccio’s to buy some goodies for Christmas I decided to try some new things and one of the new chocolate things was the chocolate coated breadsticks I found. These chocolate covered breadsticks were a bit pricy at £10 for a box so I split the box with Chocablog and decided to review my half. Well… suppose I should say something or the image will be bigger than the review. These breadsticks are not uniform in size and shape so despite being mass-produced, they have tried to make them seem slightly unique to emulate something home made. These breadsticks have been completely dipped in dark chocolate to give them a not-to-thick coating. The one thought I had was that I thought they could do with some salt so they were more chocolate coated pretzel than chocolate coated bread stick. That’s about it. The dark chocolate is uninspiring. Hmmm, try Hotel Chocolat before you mention Thorntons!